Music for dancing is not necessarily the same as music for listening. 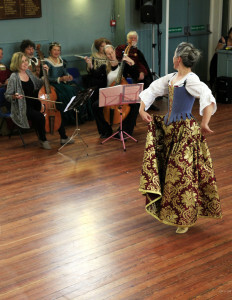 When organising the music for any performance of early dance, the first thing to decide is whether or not to use live music. There are many recordings made specifically with dance in mind (see the list below for a start). Using these, you can be sure that your band will stick to agreed tempi or reproduce other features that are vital to successful dance performance. With recorded music you do know what you are going to get. Be aware, however, that the lack of spontaneity may affect your dancers’ liveliness and also that you will need a licence to use recorded music for public performance. Information about licences is available at ppluk.com – The Official PPL Website‎. Dancing to live music has the immediacy that can bring vitality to a performance, especially if the musicians enjoy playing for dance. Early dancers and early musicians have much to learn from each other. There are many groups around the country that are willing to play for dancers, however it is important that sufficient rehearsals be provided for dancers and musicians together and that musicians understand the importance of watching the dancers. Even if the instruments are not always fully authentic, as with a folk-dance band, good rhythm will assist and inspire the dancers.The National Early Music Association (NEMA) can advise you of groups in your area. They also publish an annual directory. Many of the original sources for particular dances also give the corresponding melody-line. Modern instruction-booklets (see Learning the Dances) frequently do the same. P. Aubry Estampies et danses royales (Paris, 1907; reprinted, Genève, 1975). T. J. McGee Medieval Instrumental Dances (Indiana University Press, 1989). F. Crane Materials for the Study of the Fifteenth Century Basse Danse (Musicological Studies, vol. 16, New York, 1968). W. T. Marocco Inventory of 15th Century Bassedanze, Balli & Balletti in Italian Dance Manuals (CORD Dance Research Annual no 13, New York, 1981). D. L. Heartz Sources and Forms of the French Instrumental Dance in the Sixteenth Century (Harvard University dissertation, 1957). J. Ward Tudor and Stuart Dance and Dance Music (in preparation). A. J. Sabol Four Hundred Songs & Dances from the Stuart Masque (Brown University Press, 1978). J. Barlow The Complete Country Dance Tunes from Playford’s Dancing Master (1651-ca.1728) (London, 1985). Although there are many recordings of Early Dance music, much of what is on offer was not necessarily arranged with actual dancing in mind. If the music is to be of practical use for learning to perform the original dances, it will be wise to check that the number of repeats and the tempi at which the music is played are suitable. Instruction-booklets listed under Learning the Dances are mostly accompanied by the relevant recorded music. Commercial recordings should not be used either for rehearsal or for public performance without notifying Phonographic Performance Ltd. PPL will then issue a licence and require a fee based on estimated annual usage. Brian Jordan 10 Green Street, Cambridge, CB2 3JU [books and music]. Early Music Centre Sutton House, 2-4 Homerton High Street, Hackney, London, E9 6JQ. NEMA 8 Covent Garden, Cambridge, CB1 2HR.